is a member of the cuckoo order of birds, the Cuculiformes. It is found in South Asia, China, and Southeast Asia. It forms a superspecies with the closely related Black-billed and Pacific Koels which are sometimes treated as subspecies. The Asian Koel is a brood parasite that lays its eggs in the nests of crows and other hosts, who raise its young. They are unusual among the cuckoos in being largely frugivorous as adults. 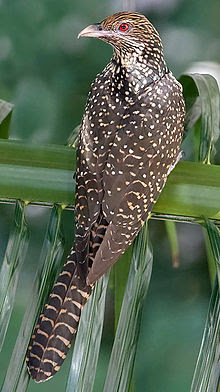 The name koel is echoic in origin with several language variants and the bird is a widely used symbol in Indian poetry. The Asian Koel is a large, long-tailed, cuckoo. The word "Koel" is derived from the Hindi word which is onomatopoeic in origin. The Sanskrit root is "Kokila" and the words in various Indian languages are similar. It is traditionally held in high regard for its song and held in reverence with the Manusmriti, an ancient decree protecting them from harm. The Vedas, Sanskrit literature dated to about 2000 BC referred to it as Anya-Vapa which meant "that was raised by others". This has been interpreted as the earliest knowledge of brood parasitism. Being familiar birds with loud calls, references to them are common in folklore, myth and poetry. It has been chosen as the state bird by the southern Indian state of Pondicherry. This bird has a strong association with the traditional new year celebrations of Sri Lanka. In the literature around the festival, the song of the bird regarded as a heralding of the traditional new year. This bird is known as the koha in Sri Lanka by the Sinhala speaking community. Especially the "first koel song" is a sign of spring. oni kakkoo オニカッコウ "demon cuckoo"
. Cuckoo (kankodori) - little cuckoo (hototogisu) .
. Haiku Culture Magazine - 2013 .
summer draught . . .
***** . Haiku from Punjab .